Wow! What a year! 2012′s in the bag as we’ve wrapped up another #devTO gift for all of you! For those who waited for us to come back in December… sorry, we were too busy doing this, this, and this. For those who came out in the yule tide fashion to the Ye Old Tech Social, The Startup Kids Screening, and hohoto party, with us: thanks for coming out! With 2012 out of the way, #devTO is entering 2013 in a big way! If you missed last month’s speakers check them out here. We have Naveenan Murugesu from RIM to speak on BlackBerry 10 development platforms and Eli Aleyner, from Xtreme Labs, speaking on What does it take to find a co-founder. Don’t miss it! The full details are below! More tickets will be opened at 8pm on January 7th. BlackBerry is an open platform that provides a variety of development languages and runtimes designed to fit your skills. Your choice of development language will be based on a combination of familiarity, pre-existing codebase, and the target devices you’re looking to serve.Each application approach (Android™, Adobe® AIR®, HTML5/WebWorks, Native C/C++) is tailored for the developer communities supporting these environments. Whether you are looking to create a tailored BlackBerry experience using Native/WebWorks/Java or wanting to take your application code base cross platform with HTML5/Android/Adobe AIR, there’s a solution for you. Garett is an Application Development Consultant with the Developer Relations team at RIM with focus on monetization technologies and push. As a member of the Developer Relations Team, Garett manages provides support to the developer community as well as partner developers. 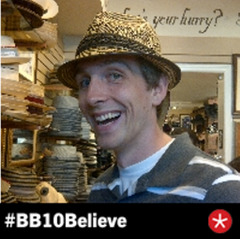 Garett’s development background consists of a degree in Computer Science and almost 5 years working with BlackBerry development and developers at RIM. Eli Aleyner and Mani Fazeli – What does it take to find a co-founder? Eli Aleyner strongly believe that finding the right co-founder for a venture is one of the most important tasks for any entrepreneur. As an MD for FounderDating in Toronto, Eli has observed how enterprenuers go about recruiting their co-founders. In this short session, Eli wi’ll share some of the patterns that work and also some of the things to avoid when looking for co-founders and launching a new venture. Eli is one of the Managing Directors for FounderDating in Toronto. Founder Dating is a premier North American network for entrepreneurs to meet co-founders. In this role Eli interacts with hundreds of entrepreneurs and has been able to observe the creation of founding teams in dozens of new ventures. Eli is also a senior product manager at XtremeLabs where he works with some of the worlds largest brands on their mobile strategy and products. Previously, he held engineering and product positions at Amazon and Microsoft. In his free time (a rarity), he enjoys running, traveling, sailing and skiing. Mani has co-founded three companies and fostered their growth from inception to steady execution in a variety of industries. He typically holds a technical role while helping address operations, branding, and fund raising needs. Mani graduated from the University of Toronto (M.Sc. Medical Biophysics) and the University of Waterloo (B.A.Sc. Computer Engineering). New Relic provides a service to track and monitor end-user experience in real-time including details like page load times, page rendering and performance metrics by page to help you identify browser performance patterns and troubleshoot performance issues your users may be experiencing. It’s a developer’s best friend for application performance monitoring for Ruby, PHP, .NET, Java and Python web applications! When people mention startup hubs, San Francisco, Boston, and now even New York come up right away. But after returning from the West coast in mid 2011, Eli Aleyner and Mani Fazeli saw huge potential in Toronto’s booming startup community. Amazing talent, great universities and new startup accelerators have them believing that Toronto can be part of this short list. That’s why they are Managing Directors of FounderDating for Toronto – working to solve what they believe is one of the biggest challenges for entrepreneurs today – connecting with the right people to get started (aka cofounders). “What Eli and I saw when we returned was a rich tech scene for the startup community to interact. On the other hand, it was difficult to find people with complementary skills and mindsets that were also ready to get started on something new” says Fazeli. “There was no good way to identify and talk with people that were ready to make the leap.”When the Toronto community unlocked FounderDating in mid 2012, Mani and Eli volunteered to help lead local efforts for the premier online network for entrepreneurs to the local community. FounderDating is an invite-only online network, with a balance between technical and business focused members (in fact 50% of FD members are engineers), that caters specifically to people who are ready to to start their next side-project or company. Every few months new members are welcomed through a kickoff event, but FounderDating delivers most of its value through its LinkedIn style online network. The difference? Not only does FounderDating screen members but they also have information about what people want to work on next. “The focus is on people, not their ideas – since at the earliest stages ideas almost always change, but people rarely do,” says Aleyner. In fact you don’t even need to have an idea to apply. “Having reviewed hundreds of applications, it is clear to us that Toronto has some of the most talented people around, and they are ready to jump into new ventures.” Both believe that finding the right co-founder makes all the difference. “It is apparent that finding the right co-founders is a huge part of any company’s success and we are happy to be helping entrepreneurs increase their odds of starting off right” Fazeli added. If you’ve been working on a side-project and are ready to find the right partners or even waiting for an opportunity to meet the right people before you get started, now is the time to checkout FounderDating and apply online. If you want to be included in the next kickoff, do it by January 11, 2013. What are you waiting for – let’s make Toronto part of that short list!